Intuitive, functional and ergonomically correct, the Penguin Vertical Mouse by Posturite is a new accessory on the scene that is out to change up the mousing game one hand at a time. 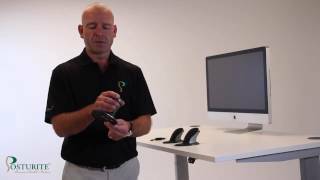 Don't strain or give in to injuries like carpal tunnel, let the mouse put your hand in the neutral position for healthier working and comfortably fitting navigation. The Penguin Vertical Mouse - Wired Large is ambidextrous and perfect for when you feel like switching hands for more comfort. A limited number of certified refurbished Penguin mice are available for purchase at a reduced price, for a limited time. Each is backed by a 30-day return policy. been using it now for a few days, and I agree that it helps significantly with my CT. I find having to track the cursor all over the desk cumbersome, and the switches (left and right), not responsive, you must click firmly and at the very center of the pad. the scroll wheel also is cheep, feels worn right out of the box. The idea is excellent but the materials are cheep. too bad. Great Product. I own 2! 1) Great customer support from Posturite. Bought product here, and was having some problems. Emailed Posturite directly in hopes of tech support and after we couldn't figure it out they immediately sent me a replacement. Straight from the UK. An update on that bit, there wasn't actually anything wrong with the mouse. There was something wrong with the USB ports on the two computers I was testing it on during the tech support part of the journey. My sample size for testing was too small I guess. Anyway, two important things here. Great product, worked perfectly. But I did also get to witness their excellent customer service first hand. 2) I've never tested this, but during my tech support quest they did ask to make sure I hadn't charged via anything other than usb port on a computer. I believe there might be a problem if you charge this in a wall outlet. 3) I've knocked it off of my desk a few times. Who doesn't with their mouse, right? One time I noticed it wasn't working when I picked it up. So I looked underneath and sure enough the laser had shifted. So I took a screwdriver and removed all of the screws holding the bottom plate in and just re-positioned the laser. Easy. There are a few screws hidden under stickers, so if it doesn't easily come off just keep peeling off stickers until you get them all. They might also be under the stick on gliders. I seem to remember removing them as well, but can't be sure. I find this mouse very frustrating to work with. I have waited several weeks to get used to it before writing this review. With a regular mouse I can move it ever so slightly with my fingers without having to move my hand. The large base on this mouse makes it almost impossible to make fine movements. The buttons on this mouse are maddening. There appears to be no way to adjust the sensitivity of the buttons although it has variable DPI for movement. The pressure needed to click on the left mouse button appears to be inconsistent. 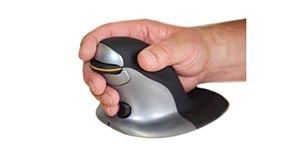 I purchased this from thehumansolution.com to help alleviate wrist pain from pronation of my hand caused by a conventional mouse. I have a mouse, a trackball and a vertical mouse on my desk. I have used other an ergo type mice in the past. The vertical mouse is the most comfortable type I've found to use for long periods. The Large mouse is actually a little too large for me. (I measure @ 20.5 mm wrist to traffic finger tip). The length of reach is pretty good, but my hand naturally puts my index finger at the scroll wheel. I have to stretch my fingers laterally (vertically on mouse) to reach. This causes some fatigue at the base of the finger. A low friction mousepad makes a great accessory. I have a Func Industries Archtype pad that is nice and large and has a low friction option. Usage: Office programs, internet and CADD software. Suggestion - put a programmable button on the crown of the mouse, to allow for a shortcut. Dropped and broke my wireless one so decided on wired this time. As I said before, I have steel and cement in my right wrist from cancer. Had difficult time with normal mouse. Looked for 6 months before selecting Penquin, so very glad I did. It took away my pain in wrist while at the computer. it is that simple, it does what it says it does. Great product.